Scientists from the UK, Italy, Germany and the Netherlands have used snapdragon genes to grow purple tomatoes that are high in anthocyanin flavonoids. The new tomatoes could offer increased protection against a range of diseases, including cancer and cardiovascular disease. The research, funded under the EU's Fifth and Sixth Framework Programmes (FP5 and FP6), was published online in the journal Nature Biotechnology on 26 October. Anthocyanins are a type of flavonoid. These powerful antioxidants are found in high concentrations in purplish plants such as black raspberry, cranberry, cherry, aubergine peel, red wine and violet petals, and have been found to have tumour-inhibiting and anti-inflammatory effects. Tomatoes are already rich in the antioxidant lycopene. Cooking tomatoes in a little oil helps to release the lycopene from the cells. Increasing the concentration of flavonoids, which are soluble in water, would be beneficial not only because of the individual properties of these compounds, but because the combination of water-soluble and fat-dissolved antioxidants in foods is considered to offer increased protection against disease. The recently published study, led by Professor Cathie Martin of the John Innes Centre in the UK, found that by expressing the genes that make snapdragon flowers produce anthocyanins, the anthocyanin levels in the tomatoes were increased threefold. This brought the concentration up to the levels seen in blackberries and blueberries, and represents a substantial improvement over previous efforts to engineer high-anthocyanin tomatoes. 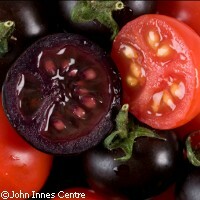 Also, the new tomatoes took on a rich purple colour. The next step was to test whether the new tomatoes conferred any biological benefit. The researchers studied cancer-susceptible mice and found that those fed on a diet supplemented with the high-anthocyanin tomatoes lived significantly longer than those fed with conventional red tomatoes. Flavonoids, which occur in many plants and form part of the human diet, have been the subject of much research because of the way they modify they body's reactions to carcinogens, viruses and allergens; they have also been shown to protect against heart disease. Anthocyanins are a class of flavonoids that occur in high concentrations in purplish plants. Recent studies of black raspberry anthocyanins have shown some tumour-inhibiting and anti-inflammatory effects. The study of anthocyanins is, therefore, of great interest for both food manufacturers and the pharmaceutical industry. EU support for the research came from the ProFood (FP5) and Flora (FP6) projects, both of which focused on flavonoids and their contribution to improving health through diet. Anthocyanin was a particular area of interest, as concentrations of this flavonoid in the most commonly eaten fruits and vegetables is not high enough to achieve optimal benefits. The ProFood project set out to create tomato plants with elevated contents of flavonoids and to apply this knowledge to various crops. Recent research has shown that benefits can be conferred by consuming relatively small amounts of flavonoids. The advantage of taking large dietary supplements is debatable and could pose some risks. Next post: How much is a Trillion?